This past weekend was the Pro Fusion Expo. The Expo is designed to help make bring together a community of filmmakers from the novice to the expert. Now before you start wondering what does this have to do with editing? Well the simple answer is editing gear. I know most of the expo is geared towards the DOP’s , But there was some fantastic editing gear on hand. First up I was able to take a look Lacie. They had on Hand the usual Lacie external drive, but I found their Raid sever mores interesting, although quiet large. The 12 big Rack Network as they call it, supports up to 24TB of data. It also supports raid modes of RAID 0, 1, 5, 6, 10, and 50, a real raid for solution for those of you with 15 grand in your pocket. Next up are the new raids from GTech. For those of you who are unfamiliar may not know Hitachi has recently bought GTech. This means every drive they put out has a Hitachi drive in it. The G Speed es Pro 8 TB raid with PCI/E-Sata cards were on display. The raids are capable of supporting RAID levels 0,1,3,5 or 6. A single G-SPEED eS PRO enclosure with four 7200 RPM, SATA II drives in RAID 0 mode supports multi-stream ProRes 422 HQ playback and a single-stream of uncompressed 10-bit HD. Two units with eight drives in protected mode (RAID 3 or 5) supports two simultaneous streams of uncompressed 10-bit HD or a single 2K DPX sequence. A fantastic piece of hardware and at a pretty affordable price, 8TB with PCIe card will run you about 2 grand. Lastly was the most interesting device I saw at the Pro Fusion Expo, was a tablet from Wacom. They had the tablet running Adobe Premier CS5. The display supports VGA and DVI inputs at a resolution of 1600×1200. 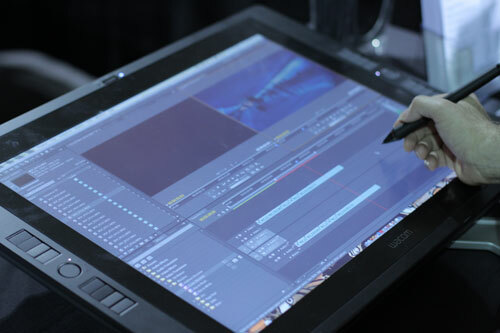 Wacom was showing the abilities of the tablet by allowing editors to demo the interface. After a few brief moments I realized that this is an interesting idea, however several flawed, as it took me longer to use the pen working in the timeline than working with my shortcuts on a keyboard. I could see this as a great tool for graphic designers, however for editors not so much. Prices begin at about 2 grand which something I just cannot justify in my workflow. The Pro Fusion Expo, and others like it are great venues for editors, as the manufactures are there to answer all your questions before upgraded any part of your NLE. This something I believe more editors should consider attending to learn about any new pos-production gear before attempting to demo in your edit suite, plus you never know what producer you might meet for your next gig.